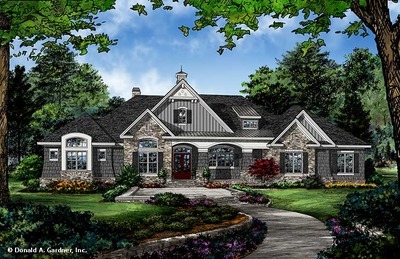 With increased sizes of vehicles and SUVs plus the plethora of recreational toys available on the market, three car garage house plans are becoming increasingly popular. Donald A Gardner Architects has a collection of home plans that help to meet the growing popularity for large garages. If your household has two vehicles, you may still enjoy the additional space for camping gear or bicycles. Whether you want to fill up the garage with automobiles or you have a need for space for lawn and garden equipment, check out our three car garage house plans. Our house plan 1371, The Drake, is designed with an oversized garage to easily accommodate 3 vehicles with room left over for storage. The three car garage enters across from the walk-in pantry into a mud room and the nearby utility room has outdoor access under a covered porch. 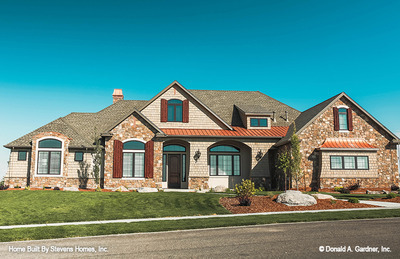 The Bartlett home plan 1372 features three garage bays and added space for storage. A personal door is available and the garage enters to a mud room for dropping shoes and bags before entering the house. If you find a house plan you like but it doesnâ€™t have a three car garage, let us make the changes for you. Our modification department can customize our floor plans to your exact specifications so the home you end up with is perfect for your needs. Modifying a house plan is easy and convenient with our architectural team that has more than 35 years of combined experience to guide you through the entire process.